The Ultimate Game For Every Wonderland Fan! Return to the Wonderful World of Wonderland! Bored with plain old Boxes? Then use Reflectors and Prisms to deflect fireballs, control rolling Boulders to solve intricate puzzles, and place explosive Powder Kegs for a real blast. Bounce on Trampolines, take a ride on a floating platform, operate box-generating machines and monster warp gates, and much more. Return to the adventure with Stinky, Loof, Qookie, Peegue, and a huge supporting cast of Wonderlanders. Flying Saucers and their giant Motherships, spooky Ghosts that travel through solid objects, strange Shadow Stinkers that mimic your every step, and enigmatic Rainbow Spirits surrounded in mystery. Discover and travel through new worlds, from Qookie's mountain cottage to the streets of Wondertown, from a spooky Forest to the blazing Fire World, from a Haunted Castle to the Edge of Space and Time! Return To Wonderland has so many fresh ideas, every level offers new puzzles, new adventure, and new excitment. The Platinum Edition comes with 20 Tutorial levels and three completed adventures with a total of 156 levels. You also get access to the Wonderland Level Exchange, where you can download thousands (!) 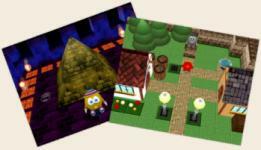 of free user-made levels, ranging from kids and beginner levels to wild and imaginative action/puzzle challenges. And if that is not enough, the Return To Wonderland Platinum Edition comes with its own level editor. 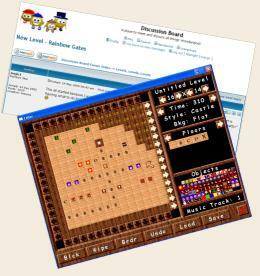 Design your own puzzles, share and discuss your creations in our online community, and download new custom levels from the internet every day. You might just never need another game! With tons of levels and features, an editor for near-unlimited replay value, and even secret features that can be unlocked over time, the Return To Wonderland Platinum Edition has everything a Wonderland fan could hope for... and more. So what are you waiting for? Get the full version today and return to the uniquely enjoyable game experience that has made Wonderland a favourite around the globe! Click here to view hints and tips for selected levels. Click here for tutorials, references pages, and more. Click here for many in-game screenshots. While there is no separate demo version for Return To Wonderland, click here for the free demo of the original game, or here for the free demo of Wonderland Secret Worlds.